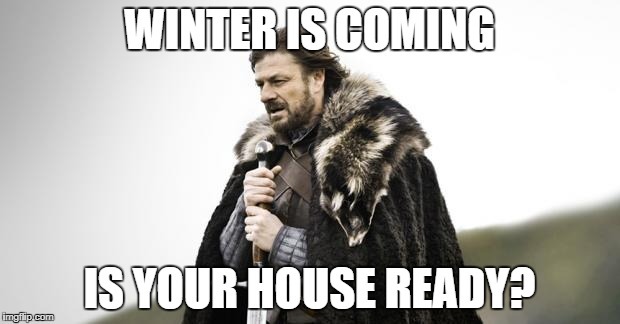 Winter is ready..is your home ready for the onslaught? Home winterization is not often a subject that comes up often when talking about DIY home automation. In fact, it is a subject that is overlooked a lot, even when talking about regular maintenance. However, when talking about saving money on heating costs, operation costs and just downright comfort, it should be on the mind of every homeowner. Some estimates of how much homeowners shell out every winter in heating costs top $2.6 BILLION. So, today we will tackle five easy, inexpensive, and yet important home winterization tasks you can do on a budget to be better prepared for the ravages of winter. Most households shell out 50 to 70 percent of their energy budgets on heating and cooling, so why pay for what no one uses? Many of the newer smart thermostats can be programmed up to a week in advance and some can even automatically adjust to your preferences on their own. So that means that when you are not home they can turn off the heat to save you dollars, then crank it up so you come home to a warm and toasty without burning through your wallet in the process. We watch the weather reports and from an early age know that cold weather will arrive. How does your house know that colder temps are coming? Sure, systems are programmed that certain times of the years are colder than others. It stands to reason that with internet connectivity and the web that smart devices would be aware. Beyond that, how would your house know? The heating and AC units rely on thermostats for the temperature. But what about the other utilities that could become interrupted due to winter? Do you have sensors on your water pipes to detect a drop of water pressure? Imagine what a few months ago what has started as a small drop of water in the first big freeze could become a case of burst pipes. That is a disaster of the worst case in January. Why stop there? If your house uses natural gas, it might be good to have a meter to let you check usage so you will know how much you have on hand so you will be able to know when you need to refill so you do not run out at the worst possible time. Let your house see winter coming and plan accordingly. Imagine being able to control your space heater from, well space? Sometimes you just want to use a space heater because you are just using one room of the house. Turning on the house heater would waste money, so the space heater is a money saving option. And everyone has gotten to the point where the room has gotten too warm or too cold and getting up once you are cozy will only make it worse. We now have the technology to change the temp remotely from an app. Even better, newer smart heaters come with tilt technology meaning they shut off if a pet or toddler knocks them over. Some even come built with special materials that keep pets and children from burning themselves if they accidentally touch it. The optimal refrigerator setting for food safety and energy efficiency is 36 to 38 degrees F. You should also keep the freezer at 0 to 5 degrees F. Setting your appliances any colder than this wastes energy. However, you might live in Texas where in July it might make sense to set the temps a little lower in July. However, come December or January it would be smart to double check your settings just because you do not want your appliances to have to work any harder than it needs to. Much of the heat trapped in the home is lost when heat escapes through the glass in the windows. This can be slowed and largely stopped with thicker curtains and blinds. Most people do like to allow as much light in the house as possible so this is a balance that must be struck. With motorized window shades and curtains, you can maximize this. Couple with a smart thermostat, you are ready to go. Picture this, the blinds and curtains open when the optimal amount of light is available. This, of course, will require the heaters to work a bit more, so that will cover any reduction in warmth. Once the sunlight lessens the curtains and blinds close allowing the heater to cut back. The best of both worlds. Winter is coming whether you like it or not. Until the Earth starts spinning, global warming causes temperatures to rise, or the sun becomes a red giant and envelopes the Earth we will always have winters to contend with. So there will always be winters to deal with. That means homes will always need to be winterized. Luckily as technology advances, we will be better prepared.